Lively, vibrant, and flavourful, Prego in Westin offers guests a deeply satisfying dining and romantic experience. A perfect location for a candlelight dinner in Gurgaon. The best place to celebrate Valentines Day in Gurgaon. The staff is friendly, fun and famous for having personalities as robust as the food they serve. The festive interior features stone, natural woods, and large windows and opens onto a beautiful terrace for al fresco dining. Location: The Westin Hotel, Sector 29, Gurgaon. threesixtyone° is a bright, spacious all-day dining restaurant in Gurgaon that affords uninterrupted views of the hotels’ reflection pool and lush green wall through a vast facade of immaculate glass. An incredible bird view of Gurgaon City. At threesixtyone° restaurant at The Oberoi, Gurgaon, you can enjoy live Japanese, Chinese, Indian and wood-fired pizza show kitchens. Their Wine library has an expansive range of international fine wines, and freshly baked goods are made throughout the day. Diners can dine indoors, or al fresco at the waterside deck, or even host an exclusive dinner in the private dining room. Location: The Oberoi, 443, Phase 5, Udyog Vihar, Gurgaon. Olive Bistro in Dlf Cyber Hub promises you a romantic dining experience with your S.O. The outdoor garden has a comfortable look & feel to it. There is so much that you will like Must try Their Pasta, Long Island Iced Tea, Mezze Platter, Ravioli, Tiramisu, Stuffed Chicken Breast and Mocktails will make your date a perfect date. Olive Bistro welcomes you with a unique vibrant atmosphere. Location: Shop 101, First Floor, Dlf Cyber Hub, Gurgaon 122008. Vibe: The view from the rooftop bar makes it the most outstanding ambience in this part of the Gurgaon City. 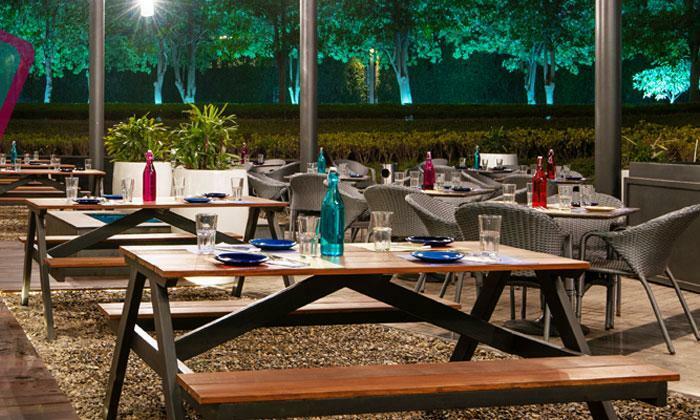 The Sky Bar is a stylish bar and restaurant at Hilton Garden Inn Gurgaon Baani Square, South City 2, Gurgaon. One of the best chilled out places Gurgaonits. Location: Hilton Garden Inn, Baani Square, South City 2, Gurgaon. Imperfecto is a perfect Roof-top Party Place with an Amazing Ambience with Lovely & Lively Environment where Imperfect things combine to make Perfect Dining Experience in the heart of Gurgaon. Bohemian and Mediterranean theme will add an extra layer of love to your date. Impromptu In Gurgaon Is Killing It With The Glass Decor For A Romantic Candle Lit Meal on Golf Course Road, Gurgaon. Perfect ambience with beautiful lush green surroundings. One of the restaurant best restaurant in Gurgaon serves European, Continental, North Indian and Italian food. Location: Ground Floor, Vatika Towers Complex, Golf Course Road, Gurgaon. Roots Cafe In The Park, As its name suggest it’s an outdoor cafe set in the beautiful Rajiv Gandhi Renewable Energy Park in Sector 29 Gurgaon. Large humidifiers, wooden furniture and comfortable sofas, hanging lights and an outdoor seating that will make your date memorable.